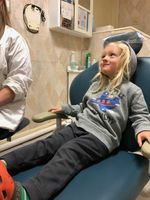 In the dentist's chair. He's probably watching that TV. Photo by Autumn. After his teeth cleaning. Photo by Autumn.